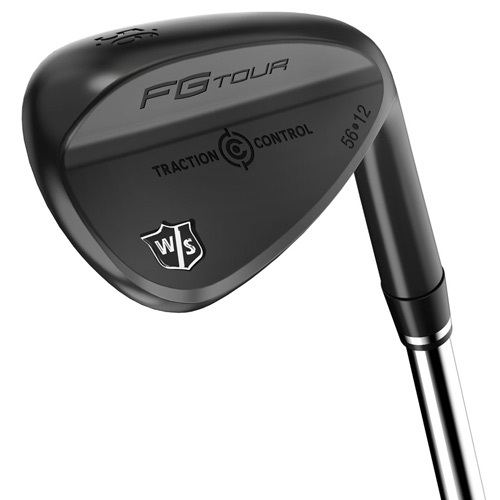 The new Wilson Staff FG Tour TC black wedges feature Traction Control (TC) technology to enhance spin on both long and partial shots. Aggressive Tour-Y grooves are milled for consistency and enhance spin on full swings. Micro-spin enhancers, or sets of 11 laser-etched lines between each groove, enhance spin on partial swings. The murdered out black finish reduces glare at address and provides a sleek, modern look. Two sole options and nine different loft/bounce combinations exist; thus, a choice of 35 unique loft/bounce/sole configurations can be achieved through custom fitting.